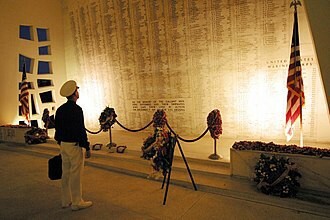 The USS Arizona Memorial, at Pearl Harbor in Honolulu, Hawaii, marks the resting place of 1,102 of the 1,177 sailors and Marines killed on USS Arizona during the Japanese surprise attack on Pearl Harbor on December 7, 1941 and commemorates the events of that day. I didn’t know — there are still remains in the sunken vessel. In a National Geographic feature published in 2001, concerns were expressed that the continued deterioration of the Arizona’s bulkheads and oil tanks from saltwater corrosion could pose a significant environmental threat from a rupture, resulting in a significant release of oil. The National Park Service states it has an ongoing program that closely monitors the submerged vessel’s condition. I didn’t know — Any surviving crew members of Arizona (or their families on their behalf) can have their ashes interred within the wreck by U.S. Navy divers. I didn’t know — that this memorial is only part of the Pearl Harbor National Memorial. I didn’t know — that Robert Ripley of Ripley’s Believe it or Not fame was one of the first people to seek a memorial raised on the site. This led to the Pacific War Memorial Commission to be created. There were many contributors to the memorial, but it was slow going as the Korean War also happened around the time when contributions were solicited. I didn’t know — $64,000 from a March 25, 1961 benefit concert by Elvis Presley was contributed to the memorial. I didn’t know — every U.S. President has made a pilgrimage to the memorial, presenting a wreath and scattering flowers over Arizona in honor of the Americans who perished there. History is important. How are we going to learn from it if we don’t know about it. History is not taught anymore. A 2012 story in Perspectives on History magazine by University of North Carolina professor Bruce Van Sledright found that 88 percent of elementary school teachers considered teaching history a low priority. “First grade might seem young, but it’s my daughter’s third year in the New York City public school system after pre-K and kindergarten. She goes to one of the finest public schools in the city, yet knows about George Washington exclusively from the soundtrack of the Broadway show “Hamilton.” She wouldn’t be able to tell you who discovered America.” Bruce Van Sledright. My rant today — Whose idea was it to stop teaching history to our children? Geography is also not taught along with Home Economics or any “shop” courses. Our children are not ready. There is so much missing from their knowledge base. They may learn more out of curiosity on their own which is great but no one will know where any country, or state for that matter is located. People don’t even know the capitols of the states. Forget reading a map; they have Google maps. No wonder the U.S. is rated 14 out of the top 20 countries with the best education system. Just doesn’t seem right that the best country in the world has one of the lowest education systems.